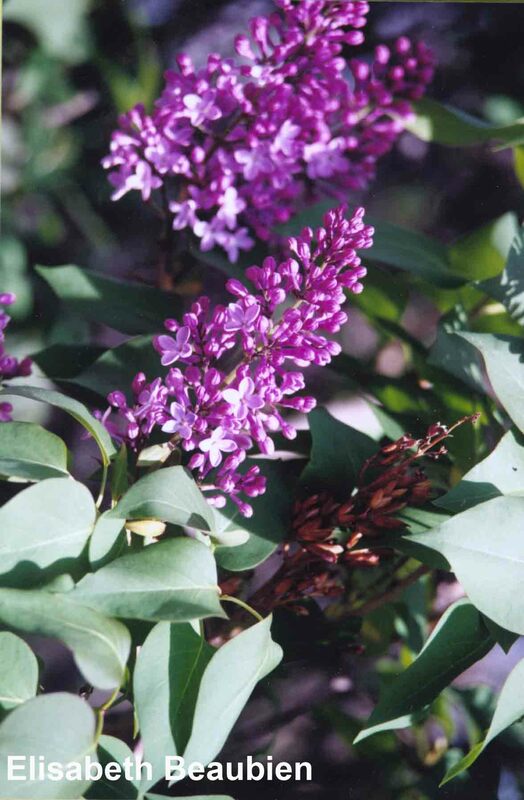 Syringa vulgaris – Common purple lilac was one of the plants most commonly brought to Canada by homesick settlers. Bushes still can be seen thriving near abandoned pioneer homesteads. The lilac belongs to the olive family (Oleaceae), which is distinguished by having plants with flower parts in multiples of twos. This family includes olive trees, forsythia and jasmine. There are many varieties of lilacs grown in gardens all over the world, with numerous flower colours including white, pink, blue and purples varying from pale to reddish to very dark. The common purple lilac described below, known and loved in much of the world for its beauty and fragrance, has been used extensively as an indicator species for phenology studies like Plantwatch. Shrub: Growing in ideal conditions, the common purple lilac can reach a height of 4 m (13 ft.), and have a spread of 7 m (23 ft.). This species of lilac produces suckers – new shoots that sprout from the base of the shrub, or from the roots. Without regular pruning, yearly growth of suckers will make the shrub very dense. Flowers: The flowers grow in clusters 10 cm – 20 cm (4 – 8 in.) long. Flower colour varies from pale purple to medium purple. The tiny individual flowers (florets) are 0.5 cm to 1 cm (1/5 – 2/5 in.) in diameter, and each has a tube-shaped base with four spreading petal lobes. Seeds: The flowers later become dry capsules containing two-winged seeds. Leaves: The leaves are dark green, heat-shaped and hairless. They occur opposite each other on the stem. Each pair of leaves is arranged at right angles to the pair above and below. The erect branches also grow opposite each other. It is important to observe only the early-blooming common purple lilac, not a later-blooming lilac species, so choose your specimen carefully! Flower colour should normally be pale to medium purple. The young winter twigs of common purple lilac are relatively unspotted, a good clue to finding the correct variety. The twig tips of some later-flowering lilacs have obvious, raised, white spots called lenticels (please do not report on these types of lilac). 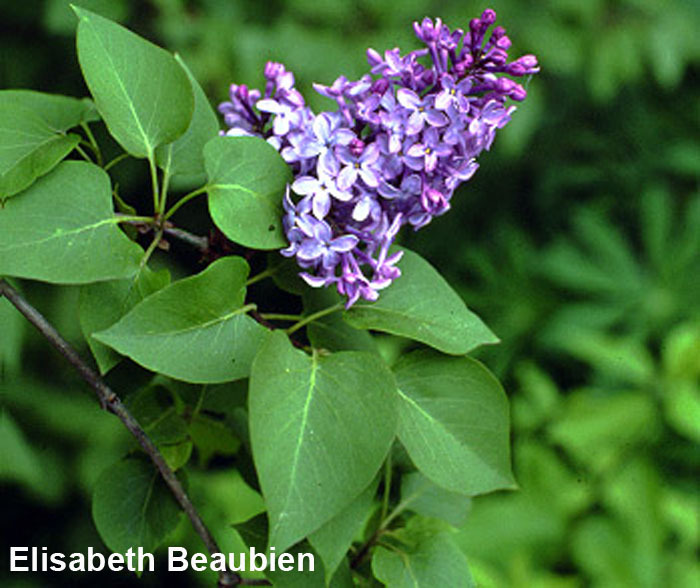 The common purple lilac has leaves that are smooth and heart-shaped. If you are unsure whether you have selected the correct type of lilac, just ask us! Clip a stem with some leaves and a small cluster of flowers, and dry it by pressing it flat between newspaper sheets underneath heavy books. When it is dry, tape the stem to some cardboard and mail it to our office in a padded envelope with a copy of the flowering dates reported. This plant is native to the rocky slopes of the central Balkans in southeastern Europe in mountainous parts of Romania, Bulgaria, Serbia and Macedonia. Even today the subspecies Syringa vulgaris var. purpurea can be found growing wild in these areas. Lilac found its way from peasant gardens in Romania to the royal courts in Europe and Asia. It was introduced to North America by early settlers and now can be found in gardens all across the continent. Although there are hundreds of cultivars of lilac, the common purple lilac is probably the most widely distributed form. Because this lilac is so widespread as a garden shrub, we have not included a distribution map. In its native habitat, the common purple lilac usually grows on dry, rocky (often limestone) slopes in colder climates. In North American gardens, it is a very hardy shrub. This lilac can withstand severely cold winters (even -35°C [-31°F]) and does not grow well in areas without significant frost in the wintertime. However, it cannot tolerate poorly drained (wet) soils and doesn’t grow well if it is shaded or crowded by other shrubs and trees. The common purple lilac is one of two non-native or introduced plants in the Plantwatch program (the other is dandelion). Lilac was selected because it is well known to act as a biological weather instrument. It has been used for over a century in Europe to study plant phenology. Studies similar to Plantwatch began in the United States in the 1950s, in which the public reported bloom times for lilac and honeysuckle to the Agriculture department. From these studies, information is available on how much accumulated heat (growing degree summation) is needed for flowering. The bloom time of common purple lilac can be used to predict the best time for certain farming activities. In Montana, alfalfa is usually ready for its first cut one month after common purple lilac start to flower. To get rid of alfalfa weevil, some Montana farmers do an early cut of alfalfa hay within 10 days of the first common purple lilac bloom, eliminating weevil eggs before they hatch. In Southern Alberta, the saying is, “Be ready to cut hay 40 days after the lilacs flower.” When common purple lilacs are in full bloom, it is the best time to treat birch leaf miner, gypsy moth larvae and lilac borer. Others feel the best time to plant corn is even earlier, when the common purple lilac leaves are 4 cm (1 1/2 inches) long. The common purple lilac does not seem to respond to the amount of daylight; that is, photoperiod does not affect the timing of its growth. Temperature in spring is the main driver for bud development and flowering. 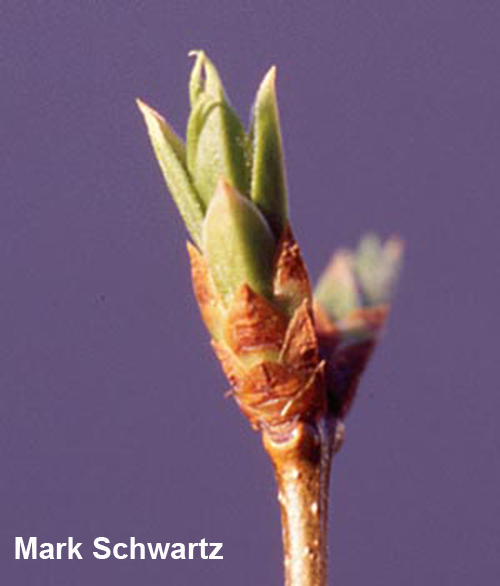 The triggering factors for dormancy and reaction to spring temperature are located in the branch tips (buds). To see the effect of temperature, watch a lilac branch growing close to a warm, south-facing wall – spring flowering on this branch will be much earlier than on branches of the same plant which are farther away from the wall. This is why it is very important to find a lilac to observe whose branches are at least 3 m (10 ft.) away from a building. 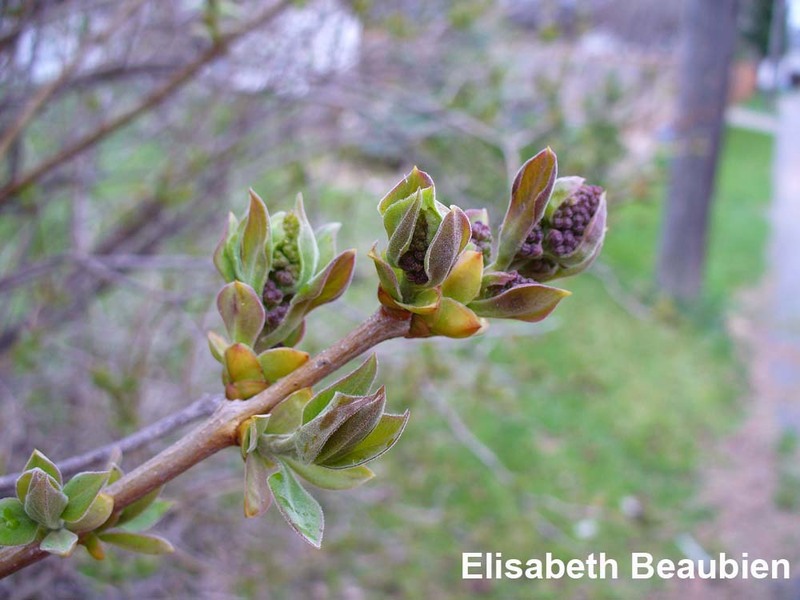 Common purple lilac buds are formed in summer for the next spring, but “chilling” is needed before normal growth occurs in spring. In areas where winters are warm (e.g., southwest Arizona, southern California), the buds do not receive the chilling needed and thus their spring growth and flowering are delayed. In these areas, the common purple lilac is not a useful indicator plant for phenology studies. Select a healthy, well-established common purple lilac that will likely remain in its position for many years. It should be in an open, unshaded area away from buildings, trees or other obstructions. Mark the plant with a tag (metal, plastic, or just tape) for future identification. When flower buds become visible in spring, start checking the shrub every two to three days. First bloom: when the first florets are open on the observed shrub (in 3 different places). Mid bloom: when 50% of the florets are open on the observed shrub. 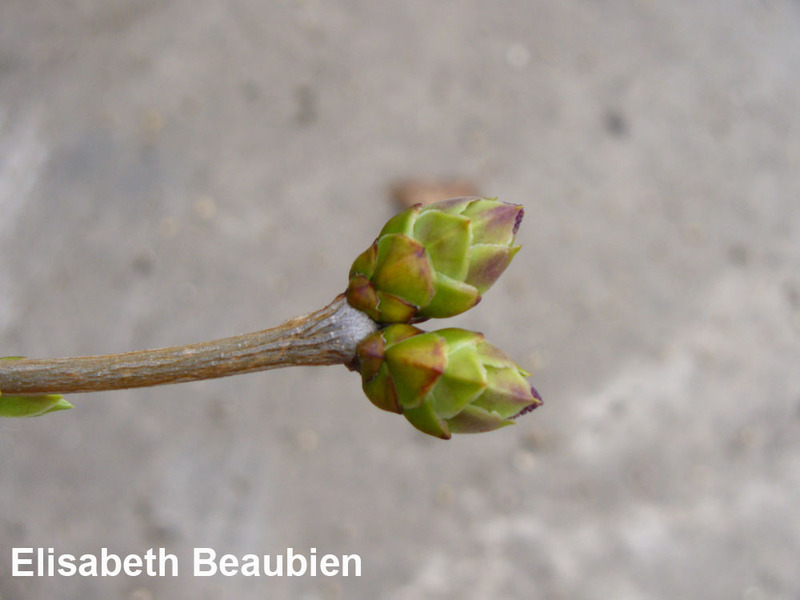 Leafing: when the first leaves push out of the bud and unfold completely (in 3 different places). Note! The maturity of the plant may slightly affect the timing of bloom. Smaller, younger plants flower earlier than older, taller plants. If you suspect your lilac is more than 20 years old, use a flexible measuring tape to check the circumference of the largest live stem or trunk at a height of about 25 cm (10 in.) above the soil. Note the stem circumference under “Comments” on your data form. Common purple lilacs flower mid-May through June on the previous year’s growth. The buds require some weeks of winter frost to set them well for blooming. After the leaves appear, the flower buds grow larger. If springtime temperatures are very warm, the flowers will appear earlier than usual but will remain in bloom for a shorter period of time. On average, it takes one week for common purple lilacs to go from first bloom to full bloom, but the timing will vary with the location and the weather. This lilac is a long-lived shrub, often living up to 50 years. Shrub stems can grow from 5 cm – 30 cm (2 – 12 in.) in length, per year. Common purple lilac was one of the plants most commonly brought from the “Old Country” by homesick settlers and planted around their homes in the New World. Apart from the beauty and fragrance of the flowers in spring, this plant also had a practical use – its dense shrubbery helped shelter a prairie home from wind. Common purple lilac bushes can still be seen thriving near abandoned pioneer homesteads. In the city or the country, the lilac hedge is a favourite place for birds because the dense foliage provides good nesting and hiding habitat. A strong lilac branch is a good place for your bird feeder! 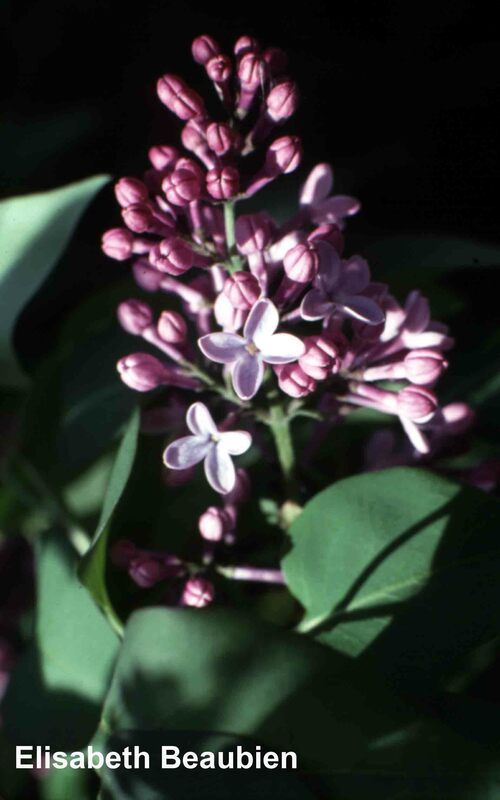 The Latin name for lilac, Syringa, originates from the Greek “syrinx“, meaning “hollow stem” or “pipe.” One of the first common names for Syringa vulgaris in English was “pipe tree,” because the straight stems made excellent pipes. The stem was used by ancient Greek doctors to inject medications into their patients. Syrinx also appears in Greek legend as a nymph pursued by the god Pan and eventually turned into a hollow reed from which he made his first flute or pan-pipe. At one time, Syringa was the name used for what we now call Mock Orange (Philadelphus); this name is still common in parts of the United States. If you like lilacs, visit gardens! Some botanic gardens have extensive lilac collections. Here you can see the amazing diversity of colour and flower shapes in different cultivars. In southern Ontario, visit the Royal Botanical Gardens in Burlington around May 18-25, the average time of peak bloom. In central Alberta, go to the Devonian Botanic Garden in late May or early June. If you wish to plant lilacs to observe in your own garden, you may be able to transplant a sucker from a friend’s common purple lilac – it will not be mature enough to bloom for a few years, however. Otherwise, a recommended cultivar for Plantwatch observers is Syringa vulgaris ‘Charles Joly’, developed in 1896 in France. 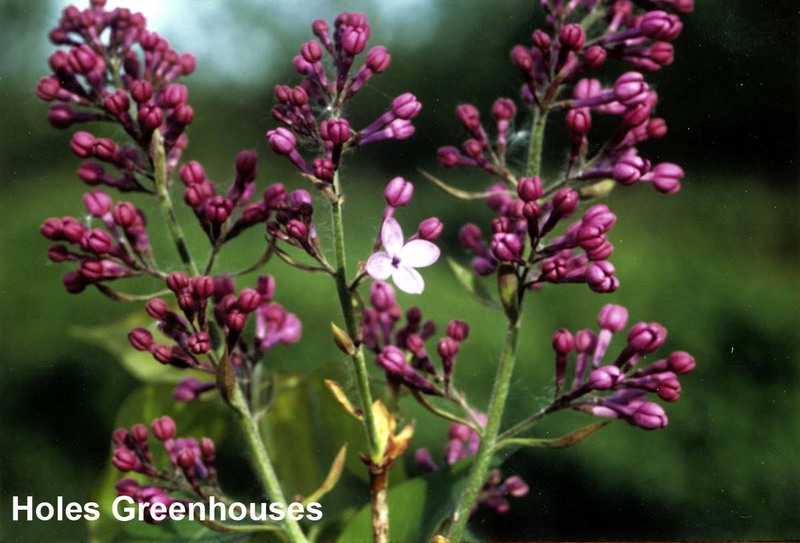 The flowers of this species are slightly redder in colour than most common purple lilacs but are suitable for Plantwatch because they are early blooming. This cultivar is usually very easy to find at nurseries. Lilacs are easy to grow. Caprio, J.M. 1957. 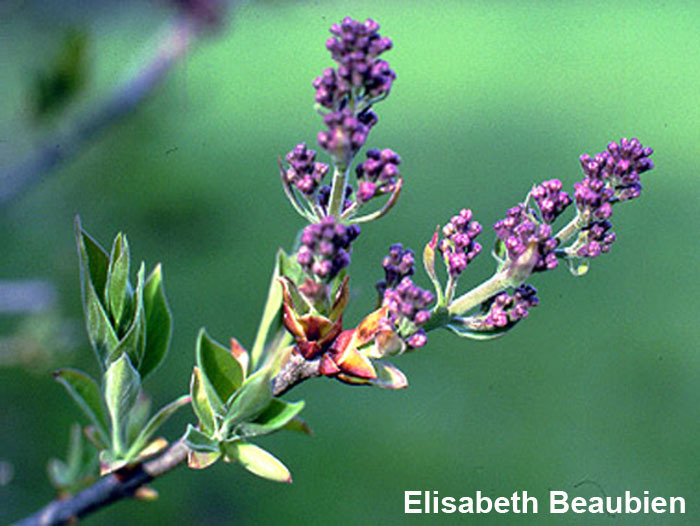 Phenology of lilac bloom in Montana. Science 126 (3287):1344-1345. ________. 1966. Pattern of plant development in the western United States. Montana Agricultural Experimental Station Bulletin 607:1-42. ________. 1993. Flowering dates, potential evapotranspiration and water use efficiency of Syringa vulgaris L. at different elevations in the western United States of America. Agricultural and Forest Meteorology 63(1-2):55-71. Dubé, P.A., L.P. Perry and M.T.Vittum.1984. Instructions for phenological observations: lilac and honeysuckle. Vermont Agricultural Experimental Station Bulletin 692. University of Vermont, Burlington, Vermont. Fiala, J.L. 1988. Lilacs – the genus Syringa. Timber Press, Portland, Oregon. Hopp, R.J. 1974. Plant phenology observation networks. In Phenology and seasonality modeling.Ecological studies: analysis and synthesis, Vol. 8. pp. 25-43. Ed. H. Lieth. Springer-Verlag, New York. Huxley, A. 1984. Green Inheritance. The World Wildlife Fund book of plants. Gaia Books Ltd., London, England. Orton, D.A. 1989. Coincide, the Orton system of pest management. Plantsmen’s Publications. Flossmoor, Illinois, U.S.A. Thanks for editing and contributions to Michael Hickman and Roger Vick, Devonian Botanic Garden, and Freek Vrugtman of the Royal Botanical Gardens in Burlington, Ontario.